Kudos to Councilman Mike O’Mara (D), District 4, which encompasses the area in north county north of I-270 plus Bellefontaine Neighbors and Riverview. It’s good to see St. Louis County Council reviving the issue of smoke-free air and seriously considering removing some, if not all, of the remaining undesirable exemptions. Missouri GASP and others have fought against exemptions in the past, but then we compromised in supporting the ballot measure which ushered in the present smoke-free air law when it became clear that was the only way to make significant progress. The most egregious exemptions remain those for the gaming floor of county-based casinos and standalone bars. It’s still a bit of a surprise to see Marty Ginsburg, formerly an outspoken critic of local smoke-free air efforts during previous public portions of county council meetings, now standing there in support of broadening these laws. The reason is partly self-serving, in that he believes he’s losing business to some nearby exempt establishments, and partly self-awareness, given that he’s observed an improvement in his health as a result of his business having to go smoke-free. Bill Hannegan’s appearance is no surprise, however, beating the drum to allow exemptions for businesses that cater to those over 21, ignoring the health and welfare of non-smoking employees. To my knowledge, he still argues that ventilation can provide better air quality in indoor environments where smoking is allowed than the outdoor air. Basically, he refuses to accept reality. 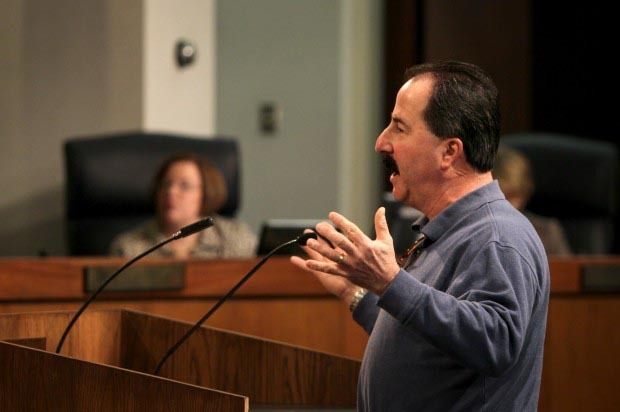 Marty Ginsburg, owner of the Sports Page restaurant in Chesterfield, addresses the St. Louis County Council about proposed changes to the county smoking ban during the public comment portion of the meeting in Clayton on Tuesday, Jan. 15, 2013. CLAYTON • Strong opinions that have smoldered since St. Louis County voters enacted a smoking ban two years ago flared up on Tuesday night before the County Council over a proposal to eliminate exemptions to the ban. About a dozen speakers weighed in regarding Councilman Mike O’Mara’s bill, introduced at the council’s regular meeting in Clayton, to permanently remove almost all exemptions to the ban. Exemptions are currently held by 135 establishments and the county’s two gambling venues, River City Casino and Hollywood Casino St. Louis. O’Mara, D-Florissant, said his proposal was designed to “level the playing field” for businesses that don’t have the exemptions. After introducing the bill, O’Mara referred it to committee for study. “We’ll work out some differences and then bring it back to the council in a few weeks,” he said. In its current form, the bill leaves in place exemptions for private residences; private clubs; performers on stage in theatrical productions; nursing homes and similar institutions; retail tobacco businesses; and permanently designated smoking rooms in hotels. Most of those who spoke Tuesday pleaded with the council to keep the exemptions. Jim Pepper, a councilman from O’Fallon, Mo., claimed that his city’s no-exemptions smoking ban, enacted in 2010, had hurt businesses there. “When St. Louis County businesses are forced to close because you removed voter-approved exemptions from the ban, you will be held responsible at the ballot box,” Pepper said. Bill Hannegan, who has campaigned against the smoking ban for years, suggested that the council tweak the current ordinance to make exemptions available only to businesses that cater to those over 21. Opponents of smoking encouraged the council to make the ban more complete. Ken Grober, of Wildwood, said he had not received any complaints since his three businesses — the Original Pancake House in Chesterfield, and two Java Plus shops in Clayton and downtown St. Louis — went smoke-free. “If you’re doing a bad job in your business, that will influence your success more than whether (the business) is smoking or nonsmoking,” he said. Pastor Bryan Mann, with the Northside Seventh-day Adventist Church in north St. Louis County, said exemptions to the ban held by several bowling alleys in the area were ruining his new hobby. “I recently took up bowling, and if you don’t think that smoke comes out of those (alley) bars — it comes out heavily,” Mann said. Voters approved the ban by a two-thirds majority in 2009, and it took effect Jan. 2, 2011. Establishments are eligible for exemptions if food sales total less than 25 percent of the annual total sales of food and beverage. The ordinance also exempted gambling floors at casinos. The County Council can change the ordinance without submitting it to another public vote. County Executive Charlie A. Dooley has said he favors removing all exemptions to the ban.